Best Deal! Explore Bangkok in 2 Days! Angmo, was extremely accommodating and was prepared to take us anywhere we wanted to go. She is informed about all the highlights of Bangkok. My friend and I had a lot of fun during the 2 days we were with Angmo. Her English is excellent. 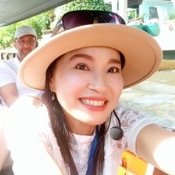 I recommend her if you are touring Bangkok. TOUR GUIDE RESPONSE: Hi Arleen, Thanks for your great review and the time spendf with me. I do hope to see you again in Thailand soon! All the best Angmo!